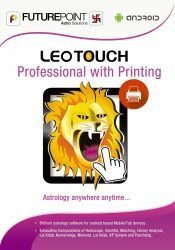 Why LeoTouch Professional is best Kundli software for mobile ? 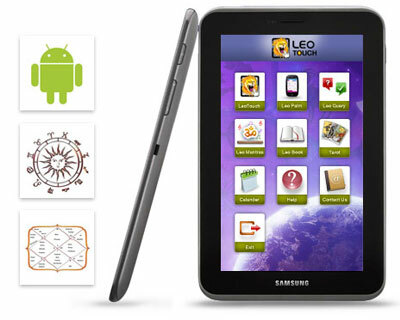 Future Point has created LeoTouch series of Kundli software for android mobiles and tablets. 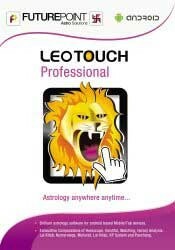 The best astrology software for android is LeoTouch Professional. It comes with and without printing facility both. Professional astrologers prefer to use this Janampatri software as it is most reliable because of its accuracy level. It supports day light saving concept, time zone calculaions and war time correction accuratly. Therefore the horoscopes of people borne abroad are also casted accurately from this software. In nutshell LeoTouch Professional is best horoscope software. This software is widely accepted, authenticated and verified by community of most distinguished astrologers of India and abroad. Create your own charts & use them into leostar.Full control of planet names, font size, color, alignment etc. User can create custom page layouts. User can create custom models.User can create custom chart templates. Operates on a cutting edge technology with lightning fast speed and accuracy. Best Kundli software for Kundli is user friendly and contains lots of fine tuned features in it. 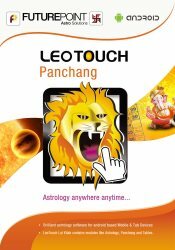 LeoTouch Professional supports almost all systems of astrology with hundred percent accuracy which can give accurate Panchang for next 10, 000 years. It gives all divisional charts, various types of Dasha, Varshphal charts, Lalkitab, Lalkitab Dasha, Lalkitab Debts, Lalkitab Teva, Lalkitab Varshphal, horoscope matching, mundane, muhurats, kp system, numerology, horary, books, calendar, astrology tables, transit, Mantras, longevity, astrograph, thousands of Yogas and other useful information. 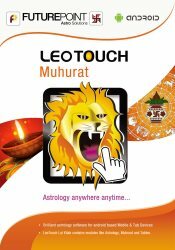 This Kundli software LEOTOUCH is available in two languages i.e. Hindi and English only. In this Vedic software several horoscopes can be viewed and matched simultaneously on one single screen. Easy to use, correct, capable of predictions by fast computations. Gem selection on the basis of Dasha, specification of metal, finger. Wearing gem on the basis of planet and Nakshatra. Mantras for Grahas, Sadesati. Articles of planets for donation, favorable points, Yogini, Lagna, Chalit, Navamsha, Dashamsha, Moon Chart, Ashtak Bindus Chart, K.P. etc. The Finance and Health Analysis on Daily, Monthly and Annual basis. Horary Tools such as Biorhythmic Chart and Tarot Cards have been included. Contains Various Calendars along with study material on Astrology, Vastu, Numerology, Palmistry and Lal Kitab. In LeoTouch, you can customize the color and font style. Contains a data of longitude and latitude of 1 Crore cities. There is option of using Neptune, Pluto and Uranus as planets in chart. Thousands of yogas are listed. Supports various Ayanamsa with a facility to add user defined Ayanamsa. Provides permanent backup for all things done. Dasha systems of 11 types – Vimsottari, Yogini, Char, Ashtottari, Tribhagi, Kal Chakra, Sodashottari, Shatabdika, Panchottari, Lalkitab & Dwadshottari. Vimshotri Dasha upto 5 level. Apart from comprehensive calculations it gives detailed predictions and effective remedial measures too. 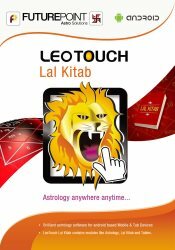 With the introduction of top Kundli software LeoTouch the big ocean of astrology calculations, Panchang, horoscope Matching, Muhurat, predictions and remedies is in your pocket now with the help of which you can do astrology anywhere, anytime. LeoTouch kundali software has its own data bank containing birth details of thousands of celebrities which can be used for research and comparative study. 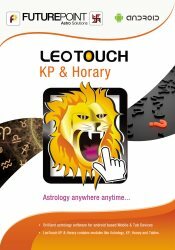 The other popular version of astrology Kundli software is LeoTouch Home. This Indian astrology software LeoTouch is also available in a Home Version (i.e. LeoTouch Home for students and home users) and Modules (all packages separately). The online version of Future Point is also best Kundli software online. The online Kundli software casts accurate horoscopes online.Astrology softwareonline is an API application which can be availed by any astrology portal for providing online service of horoscope casting.